SAN FRANCISCO — Nominations for the 2013 Takeo Okamoto Community Leadership Award and the 2013 Kay Okamoto Volunteer Award are now being accepted by the Japanese Cultural and Community Center of Northern California. Created by their children, the awards honor the memory of Takeo and Kay Okamoto for their dedication to the community. The Takeo Okamoto Community Leadership Award will be presented to an individual who embodies a spirit that is modest and scholarly, and who has positively impacted the Japanese American community through long-term commitment. The Kay Okamoto Volunteer Award will be presented to an individual who commits his/her time and energy freely and unassumingly to support the community in a variety of ways. Nominations from the community are welcomed. For a nomination form, or for more information, contact the JCCCNC at (415) 567-5505. Nomination forms must be completed and submitted by Thursday, Aug. 15. 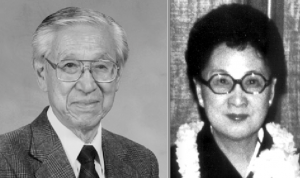 Past recipients of the Takeo Okamoto Community Leadership Award are Wallace Nunotani, Shigeru Thomas Kizuka, Mary Jo Kubota-Arcarese, Eddie Moriguchi, Daisy Satoda, Masaru Hashimoto, Joe Oishi, Sherman Mikio Kishi, Robert Rusky, Nobusuke Fukuda and Florence Hongo. Past recipients of the Kay Okamoto Volunteer Award (since it was administered by the JCCCNC) include Joanne Takata, Marcia Hashimoto, Shig Doi and Yo Hironaka. Those who knew Mr. Okamoto describe him in the most respectful and thoughtful terms. The epitome of a second-generation Japanese American, complete with stoic veneer and soft center, he worked endless hours to provide for his family while instilling in his daughter, two sons and future generations the values of respect, humility and integrity. Takeo Okamoto was an effective yet unassuming community leader. He was a founding member of the Japanese Businessmen’s Club of San Francisco, Japanese American Citizens League, JCCCNC, and Kokusei Kai Shigin Group. Further, he was active in the Lions Club, Boy Scout Troop 12 and the Japanese Chamber of Commerce of Northern California. With over 50 years of community service to her credit, Kay Okamoto epitomized the word “volunteer.” From a young age, she was active as a superintendent and teacher at the Alameda Buddhist Church Sunday School, president of the Alameda Chapter of JACL and president of the North American Federation of Young Women’s Buddhist Associations. She was devoted to the activities and education of her three children and served as PTA president, Cub Scout volunteer and classroom helper. In 1956, she assisted in organizing Hamilton Senior Center, becoming its first coordinator. Serving in this position for 30 years, her name became synonymous with Hamilton. In the 1970s, she assisted with the birth of what was to become a new senior service agency called Kimochi Inc.
Okamoto’s gracious and genuinely friendly demeanor made her a valued member to various segments of the community.